"The United States is a stronger, safer and richer country than it was when I assumed office less than two years ago," Trump declared. "We are standing up for America and the American people, and we are also standing up for the world." Trump has withdrawn the U.S. from the Iran nuclear deal, the Paris climate accord and an Asia-Pacific trade pact, while imposing steep tariffs on both allies and adversaries. He insisted his focus on American "sovereignty" has paid off, helping to foster both peace and prosperity. "The United States will not tell you how to live or work or worship," Trump told the international assembly. "We only ask that you honor our sovereignty in return." Tensions with North Korea have eased since last year's General Assembly, when Trump called North Korean leader Kim Jong Un "rocket man" and threatened to "totally destroy" the country if it threatened the U.S. or its allies. On Tuesday, Trump touted "tremendous progress" in his negotiations with Kim, even though the North Korean leader has so far taken few concrete steps to eliminate his country's illicit nuclear program. While the president's approach to North Korea has softened, his attitude toward Iran has not. "Iran's leaders sow chaos, death and destruction," Trump said. "They do not respect their neighbors or borders or the sovereign rights of nations." Since withdrawing from the Iran nuclear deal, the U.S. has reimposed sanctions on the regime, and Trump is urging reluctant partners to do the same. "We ask all nations to isolate Iran's regime as long as its aggression continues," Trump said. "And we ask all nations to support Iran's people as they struggle to reclaim their religious and righteous destiny." Other countries have been hesitant to join Trump in abandoning the nuclear deal, noting that Iran continues to abide by the terms of the agreement. Iran's behavior will also be a major focus Wednesday when Trump leads a meeting of the U.N. Security Council. Trump defended his aggressive use of tariffs, against not only China but also close allies like Canada and the European Union. "We believe that trade must be fair and reciprocal," Trump said. "We will not allow our workers to be victimized, our companies to be cheated, and our wealth to be plundered and transferred." The international community has reacted warily to the president who seems determined to unwind the world order that his predecessors spent decades building. "We reject the ideology of globalism," Trump said. "And we embrace the doctrine of patriotism." He has bucked international convention by relocating the U.S. embassy in Israel from Tel Aviv to Jerusalem, slashing aid to the Palestinians, and dramatically reducing the number of refugees the U.S. admits from other countries. "Ultimately, the only long-term solution to the migration crisis is to help people build more hopeful futures in their home countries," Trump said. The president blasted OPEC for high oil prices, announced new sanctions against Venezuela, and warned the U.S. will withhold aid from countries that challenge his agenda. 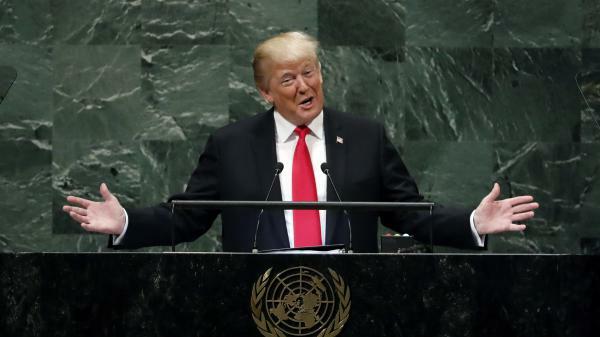 "Moving forward, we are only going to give foreign aid to those who respect us and frankly, are our friends," Trump said.